Home NEWS	Where in the world is accessibility on campus? Access to social events on campus is far from universal. Mohini Takhar, a Douglas College student in the Creative Writing program, said in an interview with the Other Press that she thinks that campus life could be better for people with accessibility needs. Takhar has cerebral palsy (CP), which is a neurological disorder that can affect motor skills, movement, muscle tone, balance, coordination, and more. In most cases, the disorder is caused by prenatal brain damage, though the complications can also occur during or shortly after birth. In Takhar’s case, she was born with three different types of cerebral palsy: spastic, ataxic, and athetoid. Ataxic cerebral palsy causes people to have problems with movement and gait as well as fine motor skills. The event she was referencing was a talent show hosted by the college. 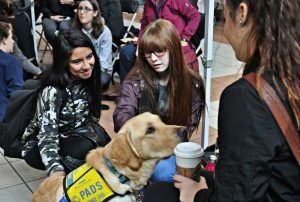 It ran from 11 am to 2 pm on December 3 and encouraged students to show off their skills at the New Westminster campus. While the DSU has hosted events like Dog Therapy Days and last week’s Find Your Chill—both of which were organized in part by the Accessibility Representative on campus—Takhar said that she thinks these events lack an educational background about the various different types of accessibility. In attempting to provide a space for less-visible disabilities, such mental illnesses, some worry that the Students’ Union may have overlooked those with physical accessibility needs. Takhar went to a Find Your Chill event hosted by the DSU last semester where the group focused mainly on mental health. Compared to other collectives on campus, the Accessibility Collective—which used to be known as the Persons with Disabilities Collective—seems to have a smaller presence than groups like the Women’s or Pride Collective. On Facebook, the Accessibility Collective has 28 members and the posts on the page are far and few in between. Although Takhar said that she felt supported in terms of academics and navigating around the campus, she would like to see more of a focus on awareness. The DSU was asked to comment but the Other Press has yet to hear back.